Book a Family Luxury or Family Plus vehicle from McRent Germany, starting in Leipzig between 1 April 09 and 15 May 09, you will get 10% discount off base rates. 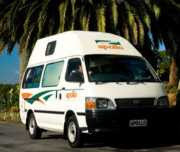 Book any Pure Motorhomes vehicle for 21 days or longer with a travel date that starts in 2009 and we'll give you 50 Euro back to help you on your way! Book a Special Class California VW T6 from Pure Motorhomes, starting in Frankfurt between 1 April 09 and 15 May 09, you will get 10% discount off base rates. Check out our post on Scenic Highways in Germany and remember, don't 'Stein' and drive!